Kit /kit/. Kit, is defined by mall ninjas and geardos as critical upgrades for their weapons or equipment that make them more combat effective. Officers and so-called, “REMF” define kit as needless junk that soldiers bolt on to their gun that further complicates logistics. The reality, is somewhere in between; some kit is tremendously useful, others are effectively worthless. Historically, soldiers have always enjoyed customizing their personal weapon, while those in charge of logistics disliked, but tolerated it. 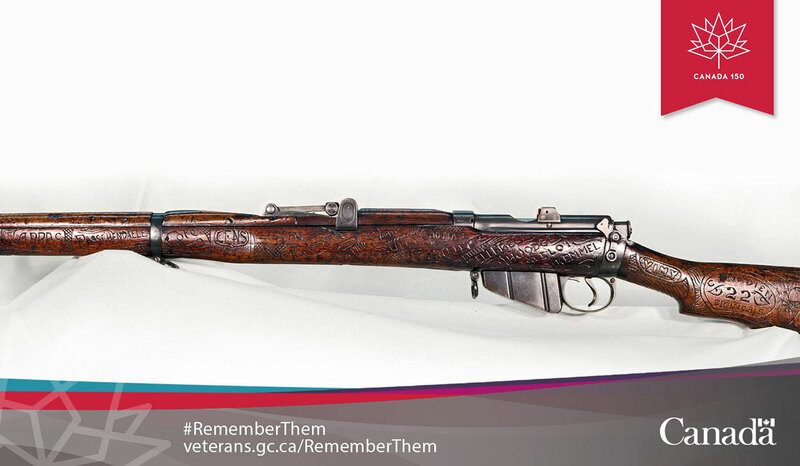 This Great War Lee Enfield exhibited in the Virtual War Museum Hill 70 ( www.Hill70.ca ) named Rosalie, was heavily customized by its owner in 1915. But attitudes towards individual weapon customization began to change during the mid 1990s with the advent of the SOPMOD program. SOPMOD, or Special Operations Peculiar MODification, is an approved catalog of accessories for the M4 weapon system. 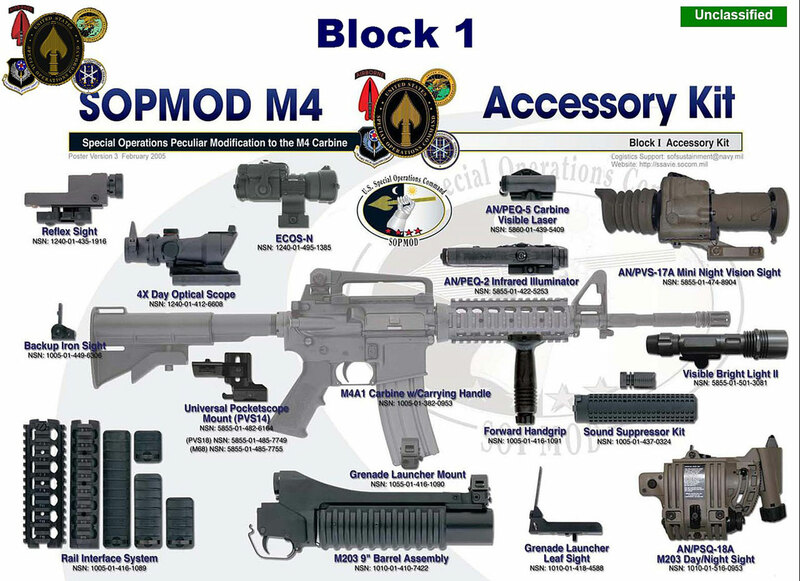 While the first SOPMOD M4 Accessory kit, designated “Block 1” was most heavily focused on providing soldiers with optics, it also included other accessories. These included foregrips, grenade launchers and even suppressors. But one of the lesser known additions under the SOF-Peculiar page, was the Sloping Cheekweld Buttstock (SCB) stock AKA the SOPMOD stock. Manufactured originally by the Naval Surface Warfare Center (NSWC) and later LMT, the SCB SOPMOD stock is much better suited for use with optics on an M4 than the standard collapsible stock. Its use of an extra wide top portion gives shooter a better cheekweld when acquiring a proper sight picture with magnified optics like the Trijicon ACOG. Interestingly enough, the SCB/SOPMOD stock looks like it was heavily influenced by the one featured on Colt’s prototype Advanced Combat Rifle (ACR). More than that, the SOPMOD is renowned for its tight specs and tolerances that result in very little wobble or play compared to standard M4 telescopic stocks. Plus, it still uses the same tools-free installation technique of mil-spec options, while retaining equal or better durability. Naturally, civilian shooters began to lust for the SOPMOD, and many rushed to buy them from companies like LMT and B5 Systems. The only issue, is that the first generation of these were priced nearly ten times higher than standard M4 stocks. Standard-issue furniture with the M4 carbine, the telescopic polymer stock accomedates vastly more shooters than the original M16A1 fixed stock. So naturally, competitors were bound to eventually attempt to dethrone LMT with cheaper alternatives. First came B5 Systems with their enhanced SOPMOD for $100 cheaper, then came others. One in particular whose price is magnitudes less, is the J&E AR Sporting Stock. Built from high density polymer, J&E’s stock bears more than a passing resemblance to the second generation SOPMOD made by B5 Systems. In fact, it employs virtually all the same features - including the dual battery compartment, textured buttpad and dual QD sling mounts. Ostensibly, the J&E SOPMOD is nearly identical to the B5 Systems SOPMOD. But the difference between the two in the details. While many of the same features of the B5 are present, the attention to detail and the precision of the components isn’t there. For instance, the lockup of the J&E stock isn’t nearly as tight on a mil-spec buffer extension as as the B5. 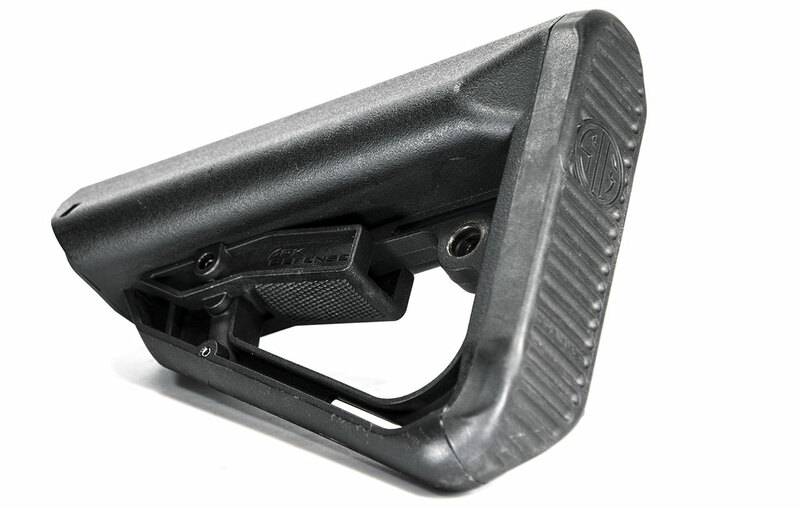 While the B5 stock has nearly zero perceivable play in it, the J&E Machine SOPMOD can move a quarter inch along the z axis and can wobble up and down. 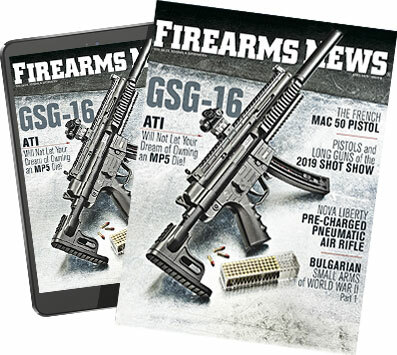 SIG worked with Ark Defense to build the polymer furniture for their 516 series of rifles and carbines. But that doesn’t mean the entire design is flawed. The polymer used feels more rigid than that on both the B5 and the Ark Defense SIG-branded Enhanced SOPMOD. So while it may feel stronger, it’s more likely to crack under hard use then bend. That said, in testing the J&E stock showed no signs of failure under either normal, or abusive conditions. 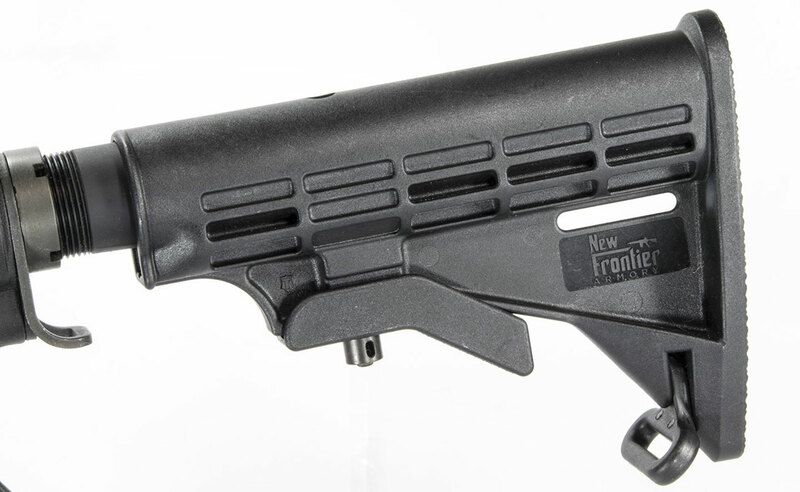 This writer slammed the stock on a wooden bench with a tremendous amount of force while mounted on an LaRue Tactical carbine, with only minor scuffs to the recoil pad. 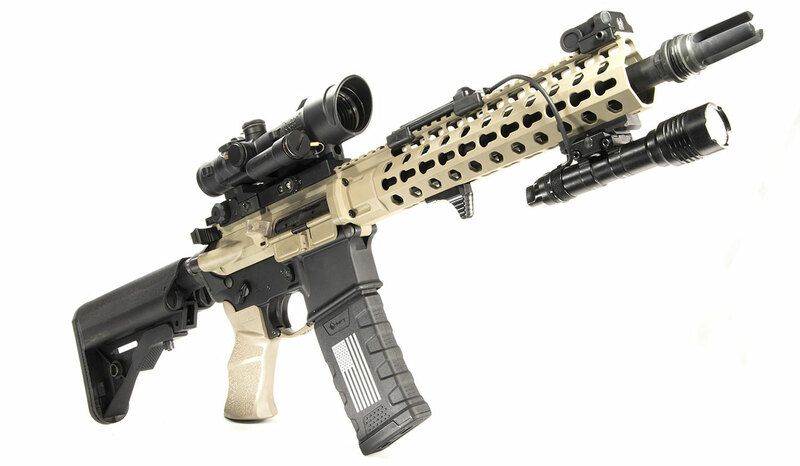 J&E’s AR Sporting Stock is a natural fit on the author’s LaRue Tactical SBR. 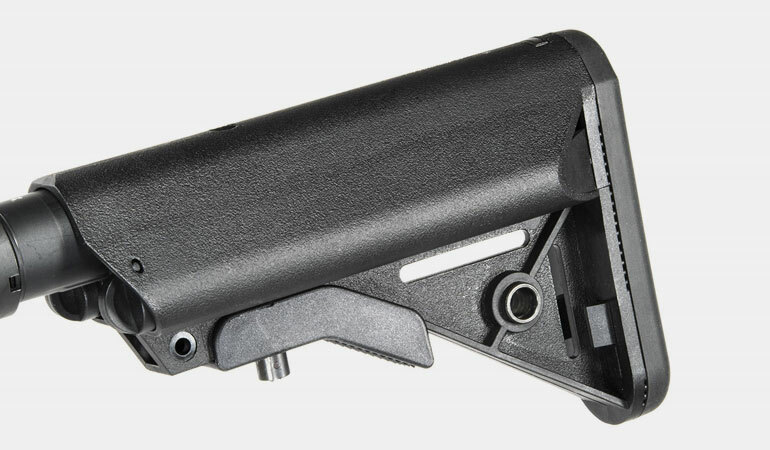 The adjustment lever worked on 100% of the mil-spec receiver extensions tested, and is a dramatic improvement for cheekweld over standard M4 stocks when coupled with optics. So what’s the takeaway? The SOPMOD design as a whole, offers tangible upgrades over original M4-style telescopic stocks. The J&E Machine version seems to address the unaffordability of some of the mil-spec options for shooters on a tight budget. I’m sure other models offer more features and enhanced durability. That said, if the better cheekweld of the SOPMOD stock is critical to a shooter and they don’t want to spend over $100 to acquire it, the J&E Machine AR Sporting Stock is a solid choice.